Carbon Dividends – a Conservative View; Janet Yellin, former head of the federal reserve, says carbon tax is the most efficient means to handle climate change. The conservative think tank, the Climate Leadership Council CLC, want to see carbon tax paid out as dividends to consumers. The CLC website says rebating all carbon fees directly to the people is the most equitable and politically-viable climate solution. The Nobel Prize in Economics was awarded to William Nordhaus in 2018, for modelling the financial aspects of climate change. Nordhaus also has identified carbon tax and / or carbon dividends, as the most efficient way to modify capitalism in order to address climate change. The goal is to move commerce in the direction of a Sustainable Planet. With tax schemes above, entrepreneurial persons will want to move toward low tax / higher profit businesses. Raising some taxes and lowering others makes it tax neutral to the consumer, who will continue to make choices with their wallets. Conversely, the businesses which polute the planet, and destroy its non-renewable resources, while generating carbon dioxide and other greenhouse gases, should be paying for that damage. This extends the concept of carbon taxes and meat taxes to everything. The goal is to make destructive activities expensive!! The marketplace will take care of the rest. Worried about the impact on the consumer? 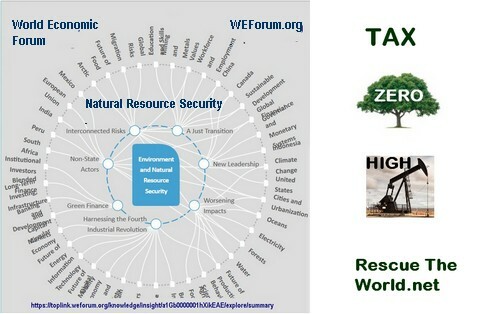 For some ideas on how to participate in a shift to Sustainability Tax in economic principles, please see the page on SOLUTIONS. Ethical or sustainable capitalism is defined there as a combination of global sustainability tax and global human rights in the workplace.